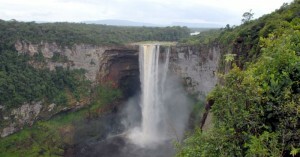 Located in the heart of the rainforest on one of the world’s largest sandstone plateau,Kaieteur is located on the Potaro River, a tributary of the Essequibo River. The Kaieteur Falls with a sheer drop of 741 feet is the highest in the world;a natural wonder in the tropical forest.Charles Barrington Brown discovered the Kaieteur Falls in 1870.The majestic Kaieteur Falls attracts tourists from all over the world. 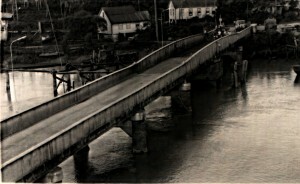 The Canje Bridge replaced an old swing bridge structured of iron and concrete by Joseph Westwood,an English Civil Engineer in 1891. This antiquated mechanism was an historical landmark for more than 85 years.It was swung out to allow the tall masts of sugar-laden vessels to go through,then the two portions were swung back in to allow the flow of vehicular traffic again. The current bridge which became operational in February 1978 is 1,732 feet long,33 feet wide and 45 feet high crossover which took 18 months to complete.